These buttery, garlicky nuggets of bread taste just as good as the pizzeria variety, and making them is almost easier than calling for delivery. 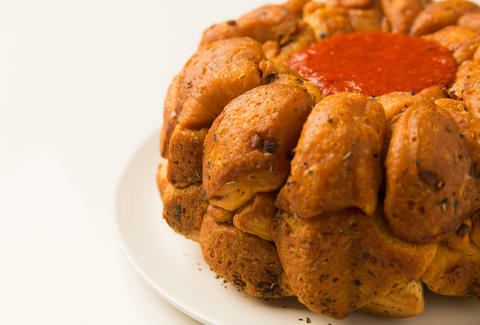 Just toss bits of dough in cheesy garlic butter and dump them in a bundt pan. The resulting bowl is made of chunks of bite-size bread, with each piece perfectly crusty on the outside and soft on the inside. Fill it up with tomato sauce for convenient dipping, and enjoy the fact that there’s no delivery man to judge you for ordering knots as an appetizer for that entire pie you're obviously eating solo. Cut each of the 16 biscuits into quarters, making 64 pieces. Pour olive oil into the bottom of the pan. Combine the butter, Parmesan, garlic, seasoning, garlic powder, and salt in a medium bowl. Dip each piece of dough into the butter mixture and place in the pan. Bake for 30-35 minutes, until golden brown. Remove the bread from the oven and let cool in pan for 15 minutes. Turn it out of the pan onto plate. Stuff a small dish or piece of aluminum foil into the bottom of the hole. Fill with pizza sauce. 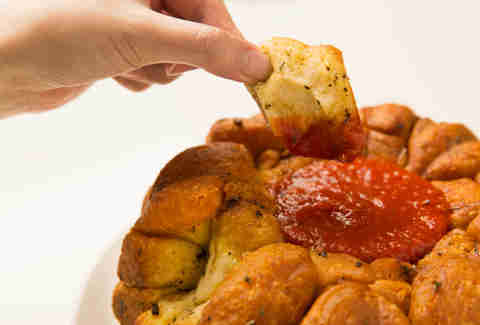 Pull pieces of garlic bread from the bowl and dip away.